Summer is just around the corner, the guys over in Japan have already got the party started, thanks to the KDDI operator and its 2010 summer collection of 10 mobile phones. Despite being quite different, they have one thing in common, all 10 of them are waterproof. Now, I’m not going to dig deep in details but each of those 10 phones deserves its brief moment in the limelight. The Casio Exilim CA005 is a stunning 13-megapixel cameraphone equipped with a 3.2-inch LCD IPS screen of VGA resolution. Next up are 3 12-megapixel cameraphones. Both the Toshiba REGZA T004 and the Sony Ericsson Cyber-shot S003 come with VGA TFT displays measuring 3.2 inches. On top of that, the REGZA T004 is powered by a snappy 1GHz Snapdragon processor while the Cyber-shot S003 is said to be the first waterproof slider. As for the Sharp AQUOS SHOT SH008, it sports a huge 3.4-inch Sharp ASV screen of 480 x 854 resolution and support for Wi-Fi. Like the rest of the phones mentioned so far, the AQUOS SHOT SH008 also offers a TV tuner, microSD card slot, Bluetooth support and an IrDA port. All 4 of the following phones are capable of taking 8 megapixel images. The Sanyo SA002 features a 3-inch TFT display while the other three devices have 3,2-inch screens on board. Measuring only 112 x 49 x 14.8 mm, the SA002 turns out to be the slimmest waterproof slider ever announced (the Cyber-shot S003 measures 118 x 52 x17.6 mm). The Sony Ericsson BRAVIA S004 impresses with its unusual form-factor which is quite reminiscent of the Nokia N92. Like the Toshiba REGZA T004, it is has a Snapdragon CPU inside. The Sharp SOLAR PHONE SH007, like its name reveals, sports a solar panel. According to the manufacturer, 10 minutes of sunbath should be enough for a 2-minute phone call. The last member of this group, Hitachi Beskey, has a user-replaceable keypad and you can choose from three different keypad designs. Finally, there is another couple of phones left. 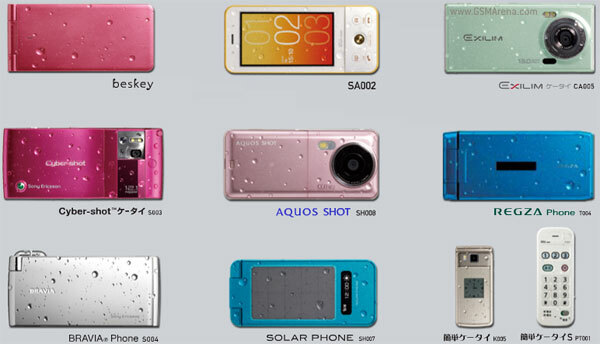 Like the rest so far, the Kyocera K005 and the Pantech PT001 are waterproof. The Kyocera has a 3-inch TFT display, a 3-megapixel snapper and a microSD card slot. The air-conditioner-remote-control-look-alike Pantech PT001 on the other hand has no screen (unlike most air conditioner remote controls) and is meant for elderly users. The 2010 summer collection of Japan’s second largest operator, KDDI, should become available by the end of the month.